The Quinnipiac Bobcats picked up another commitment out of the BCHL today in 1998 born forward T.J. Friedmann who plays for the Victoria Grizzlies. The commitment is for the 2019-2020 season according to a source. A native of St. Louis, Missouri, Friedmann is a 6'3, 179 pound center that brings size and skill down the middle. 3.5 prospect is a skilled center who is light on his feet, has good speed and has soft hands. The tall forward makes plays, shoots to score and contributes on both special teams units. Earned B+ at @bchllive Showcase in September. Friedmann is tied for third on the team in scoring with 30 points (10 goals, 20 assists) in 37 games played. Of his 30 points, 11 of them have come via the power play (4 goals, 7 assists). A year ago he posted 33 points (16 goals, 17 assists) in 38 games played for the Grizzlies along with another 3 points in 15 playoff games. 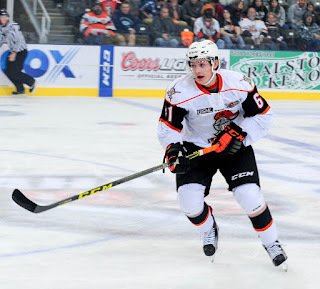 He previously played two games for the Green Bay Gamblers in the USHL in the 2016-2017 season and has 49 games played in the NAHL for the Springfield Blues in the 2014-2015 season. He played midget hockey for both Victory Honda U-18 and St. Louis Selects 16U. Congratulations to T.J. and his family on this great accomplishment and welcome to Bobcat Nation. 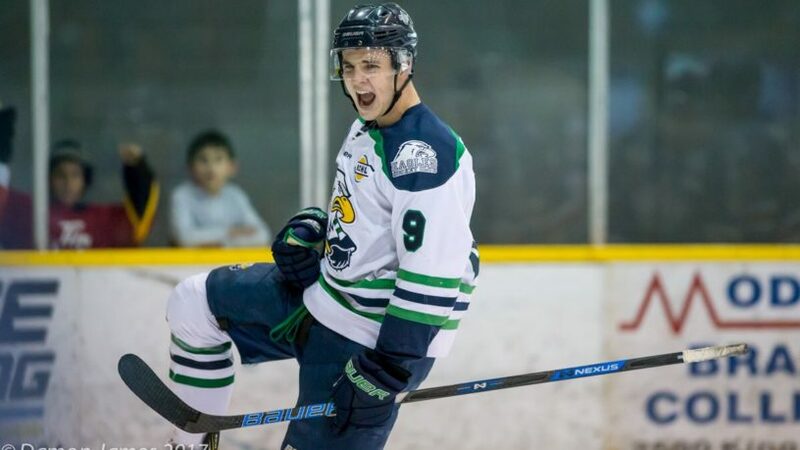 Quinnipiac recently picked up a commitment for the 2018-2019 season in Surrey Eagles (BCHL) center Desi Burgart. A native of Penticton, British Columbia, the 6'1, 180 pound left shot center committed to the Bobcats on December 18th and is expected to give Quinnipiac some much needed center depth for next season. The Bobcats Hockey Blog recently caught up with Desi to discuss hockey and his commitment to Quinnipiac. Thanks to Desi for the time he gave for this Q&A. Jonathan Singer: First off congratulations. This must have been a nice early Christmas present for you and your family? Desi Burgart: Definitely for sure. It has been a long time coming and a patient wait for me and my family, but it was nice to finally get something done especially right before the holiday's. It takes a lot of stress off and it made for a great Christmas at home. Jonathan Singer: Tell us when you first started playing hockey? Desi Burgart: I was probably five-years-old the first time I ever skated and I started taking skating lessons regularly before I started playing minor hockey. I had a lot of friends from elementary school that already played and it was something I loved watching so I started to play. 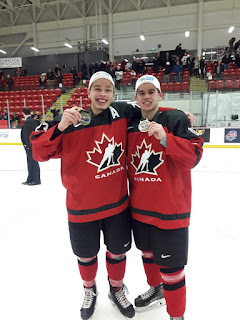 Kelowna, British Columbia was a great place for me to start to learn and develop at a young age because the competition wasn’t too high and it helped me to really find a passion for the game. Jonathan Singer: How was your overall recruiting experience? What other schools had interest in you and what factors went into finally deciding that Quinnipiac was the right fit for you? Desi Burgart: The process was long. I had a good first year with Surrey and started to gain interest from some schools in the Atlantic Hockey Conference and that carried over into this season. I went on a couple visits to two schools in the Atlantic and decided that they weren’t the right fit for me and was really just waiting for that one school to approach that I knew had the whole package. Education has always been a big focal point for me and my family and when a school like Quinnipiac comes knocking it really isn’t a hard decision. Quinnipiac’s track record in hockey is one of the best in the NCAA over the last five years and the campus combined with the high level of education really made it an easy choice. Jonathan Singer: I heard you committed without a visit to the Qunnipiac campus. Is that correct? Desi Burgart: Yes that’s correct. 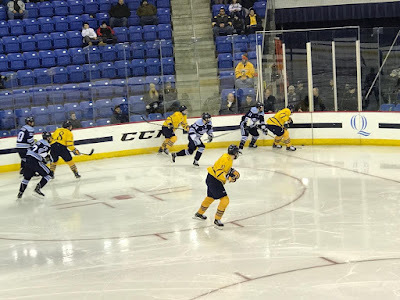 The process with Quinnipiac happened quite fast and coach Dumais sent me some clips of the campus and I felt like I got a good enough feel for the campus that taking a visit wasn’t really necessary. Jonathan Singer: Will you take a visit during your season with Surrey or head to Quinnipiac after your season to get the full experience? Desi Burgart: I haven’t decided yet. It's getting into crunch time in our league and we are coming down the stretch in a good playoff position so I will have to leave that up to my coach and whether or not he wants me to leave at an important time of the season. Jonathan Singer: Tell Bobcat Nation what type of player Desi Burgart is on the ice? What are some of your strengths as a player? Desi Burgart: I’ve always thought of myself as a two-way player who plays the game the right way and do the little things right. Defense has always been a part of my game that I take pride in and I don’t shy away from chipping in offensively. I play a fast pace, physical style of hockey and that fits well with my size. I protect the puck well and I have a good shot and I utilize my teammates well in the offensive zone. Jonathan Singer: When coach Dumais reached out to you and you eventually committed what role did he envision he has for you on this team next season? One of the things that Quinnipiac has been lacking this season is a natural centers and it looks like you are a natural center that this team desperately needs. Desi Burgart: We haven’t really talked about it too much, but the one thing in talking to both coach Dumais and coach Pecknold is that they are in need of center depth as you said, and I feel that’s where I will be playing. As for what role I play that will be determined by me and my work ethic coming in at the start. You can never expect anything and everything must be earned and that’s how I anticipate it will be when I come in. Jonathan Singer: What are some of the areas of your game which you want to improve upon before coming to Quinnipiac? Desi Burgart: I want to get faster for sure. I'm not a slow skater by any means, but making the jump from junior hockey to college hockey is something that isn’t easy. You go from playing against teenagers to playing against grown men, so speed and strength is something that I will be stressing in the off-season. Jonathan Singer: Is coming to Quinnipiac over the summer to get a jump start on training something you are considering? Quinnipiac has a tremendous strength coach in Brijesh Patel. Desi Burgart: Yes for sure. I’ve heard great things about him from coach Dumais and it is definitely something I’m considering doing. Jonathan Singer: Is there any player that you try to model your game after? Desi Burgart: TJ Oshie is a player who I’ve always loved watching and I can see some similarities in our games. Obviously he is an incredibly skilled player with tremendous offensively ability but he also is a reliable player in the defensive zone and in any situation, so he’s definitely a player who I look up to and try to play like. Jonathan Singer: Tell us the type of person that the Quinnipiac University community is going to get in you? Desi Burgart: I am a very hard worker and a responsible guy. I stray away from stuff that would jeopardize how people view me as a person. I’ve put in a lot of work to achieve this scholarship so maintaining a good public image and continuing to work on and off the ice will be something I will expect out of myself for sure. Jonathan Singer: What does Desi Burgart like to do off the ice? Desi Burgart: I grew up in a big golf family so I try to play as much golf as I can in the off-season just to get away from the rink and reset before the next season. My dad has been in the golf business for his whole life and its something that just comes naturally for me and is definitely something I love doing. Other than that I enjoy hanging out with friends and being as social as possible as it keeps me busy. Quinnipiac picked up its second commitment of the night on Monday. Less than an hour after the verbal commitment of Jack Silich, the Bobcats tapped back into Western Canada with the commitment of 1998 center Desi Burgart of the Surrey Eagles in the British Columbia Hockey League. Burgart is off to a good start for Surrey with 31 points (14 goal, 17 assists) in 32 games played. He is third on the team in scoring but of players eligible to play NCAA hockey he effectively leads the team in scoring as the top two players are major junior veterans. Five of Burgart's 14 goals have come by way of the power play. A year ago for Surrey he had 45 points (19 goals, 26 assists) in 52 regular season games. A year ago he was also a member of the Canada West team at the 2016-17 World Junior A Challenge. At 6'1 180 pounds, Burgart a native of North Vancouver, B.C. will give Quinnipiac some size and depth down the middle. Burgart is coming in for the 2018-2019 season especially with the Bobcats needing center depth for next season. Congrats to Desi and his family on this great accomplishment and welcome to Bobcat Nation. 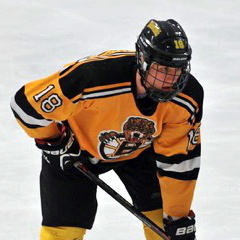 Quinnipiac has picked up a verbal commitment from their first 2003 born player. Chicago Mission bantam forward Jack Silich has gave the Bobcats a verbal commitment tonight. 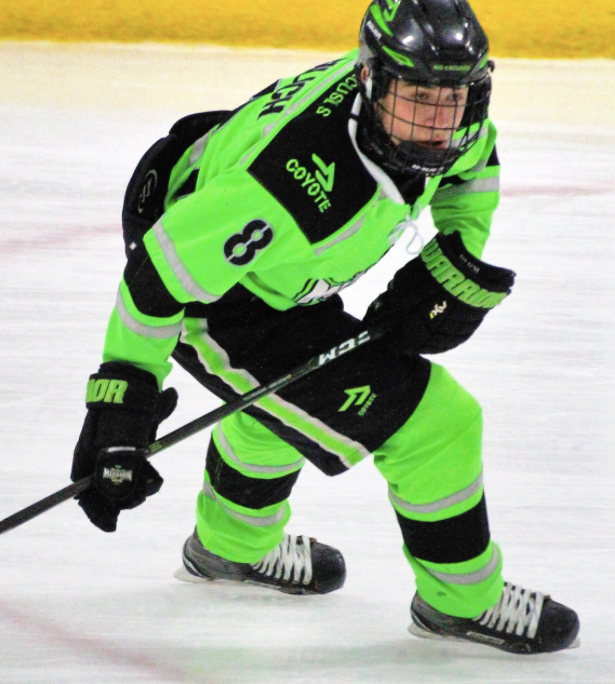 ‘03 Chicago Mission forward Jack Silich commits to Quinnipiac. 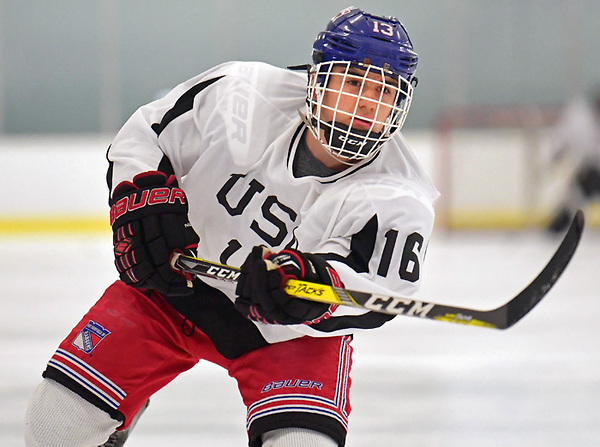 Big right shot played physical game both ways and drove the net at USHL Fall Classic. According to scout Jeff Cox, the 5'8 154 pound Silich plays a heavy game. Check out Jeff's write-up on him at the 2017 USHL 14U Fall Classic. On the season in 42 games played he has 60 points (24 goals, 36 assists). Within those 42 games are 10 HPHL games where he has 6 points (4 goals, 2 assists). The Mission are one of the elite programs in the mid-west and not a program that Quinnipiac in the past has really tapped into so this looks like a positive development that they are looking to tap into a Chicago market rich on talent. Silich is projected to arrive in Hamden for the 2021-2022 season but could also be for the 2022-2023 campaign. Congrats to Jack and his family and welcome to BobcatNation. With Quinnipiac fully fledged into winter break, there are still future commits playing in junior hockey, prep hockey or midget hockey. Most of these leagues will be taking a Christmas break so "In the Pipeline" will not be running next week with basically no games being played for the next week plus so Happy Holidays to all in BobcatNation. Ethan de Jong had a strong 2017 World Junior A Challenge helping to lead Canada West to a gold medal. In 5 games played, de Jong had 4 points (1 goal, 3 assists). In the preliminary exhibition game he potted a goal and an assist. 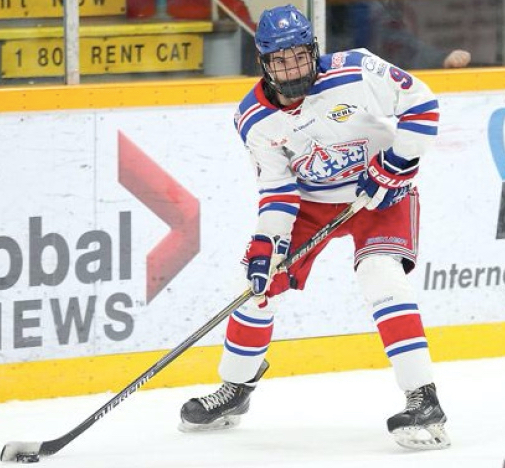 He will now head back to the Prince George Spruce Kings after the holiday break. Congrats to Ethan on this tremendous accomplishment. 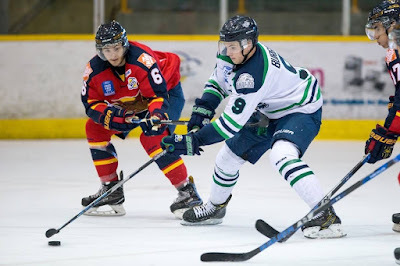 Michael Lombardi had a strong week with 4 points in 2 games highlighted by his goal and two assist performance on Sunday against Powell River. On the season, Lombardi, a Rhode Island native has 22 points (10 goals, 12 assists) in 34 games. Wyatt Bongiovanni had a 3 point night for the Muskegon Lumberjacks on Saturday night in a 4-2 win over the Chicago Steel. Bongiovanni now has 18 points (10 goals, 8 assists) in 22 games after only having 2 points in his first 9 games of the season. William Fällström picked up a goal over the weekend for the Fargo Force in a weekend split with the Waterloo Blackhawks. On the season Fällström has 16 points (5 goals, 11 assists) in 23 games played. Zach Metsa picked up one assist in two games played over the weekend for the Youngstown Phantoms in a split of two games against the Cedar Rapids Roughriders. On the season Metsa has 11 points (1 goal, 10 assists) from the blue line in 22 games played. Justin Robbins gave up 3 goals on 14 shots for the Chicago Steel in a 4-2 loss to the Muskegon Lumberjacks. On the season Robbins is 1-3 with a 4.76 goals against average and a .859 save percentage. Guus van Nes picked up another 3 point week with a goal and 2 assists in 3 games played for the Junior Bruins. He continues to lead the NCDC in scoring with 40 points (13 goals, 27 assists) in 30 games played. He is one point ahead of former Quinnipiac commit John DeRoche who has 39 points. Daniel Winslow had a strong week for the New Jersey Hitmen with 5 points (2 goals, 3 assists) in 3 games played. The Connecticut native has 24 points (9 goals, 15 assists) in 25 games played this season. 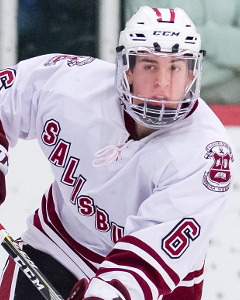 This past weekend I scouted Peter Diliberatore for Future Considerations and while he did not get on the score sheet he was one of the most impressive players I saw play in a 3-2 win for Salisbury over Deerfield at the Flood-Marr Tournament at Nobles & Greenough School on Saturday. He is quick puck moving defenseman who is sound in his own end and has the speed to join the rush and contribute on offense along with having the recovery speed to get back. He had at least a half dozen shots from the blue line and had a fantastic chance at the net which he did not convert and shouted his emotions about it on the bench. I'd expect the 2000 born defenseman if his play continues like this to be an NHL draft pick in June of 2018. Matt Fawcett had 4 points in 2 games (2 goals, 2 assists) but there are two games from the St. Sebastian's Holiday tournament where the box scores have not been posted yet. In the games we do have statistics on, Fawcett has 11 points (5 goals, 6 assists). Matt Cassidy had a 3 point game (1 goal, 2 assists) in a 7-2 Brook Bandits win over the Fort McMurray Oil Barons Saturday night. In 27 games played this season, Cassidy has 24 points (10 goals, 14 assists). Dom Fensore had one assist in three wins for the U-17 US National team in the 4 nations tournament in Russia. The US scored 21 goals in 3 wins over Slovakia, Switzerland and Russia. Ethan Phillips picked up a goal and an assist in a 4-1 win for the Selects Academy at South Kent U-16 team in a 4-1 win over the Jersey Shore Whalers in USPHL U-16 play. Victor Czerneckianair had a strong weekend for the South Kent U-15 team with 6 points (2 goals, 4 assists). On the season he has 47 points (21 goals, 26 assists) which puts him third on the team overall in scoring. Jacob Quillan had a 2 point weekend (1 goal, 1 assist) for the Steele Subaru Major Midgets. On the season, Quillan leads the team in scoring with 31 points (11 goals, 20 assists) in 27 games played. He is expected to come to the United States next to play prep hockey in the New England region. Austin Spiridakis had a goal and an assist in a 3-2 win on Sunday for the St. Albert Tire Warehouse Raiders AAA team. In 23 games played, Spiridakis has 12 points (6 goals, 6 assists). Quinnipiac ended the first half on a sour note getting swept at home by the Maine Black Bears to fall to 6-10-2 on the season which is the worst first half of a season in their Division 1 history and first losing first half of the season since the 2005-2006 season. The team now gets a much needed breather and doesn't play again until January 2nd. With the fact that the team is now 47th in the pairwise, the expectations now should be lowered due to the teams play as the only way into the NCAA tournament now at this point would be catching fire and winning the ECAC tournament. Let's take a look at how some of the future Bobcats did this past week. It was a strong weekend for William Fällström of the Fargo Force as he had a goal and three assists in two games played for Fargo which resulted in a pair of wins over Waterloo. On the season Fällström has 15 points (4 goals, 11 assists) in 21 games played. He is expected to be one of the top 3 centers for the team next season. a weekend split of two games against the Sioux Falls Stampede. On the season Metsa has 10 points (1 goal, 9 assists) from the blue line in 20 games played. Justin Robbins picked up his first win of the season for the Chicago Steel on Saturday. He made 29 saves in a 7-3 win over the Madison Capitols. In 5 games played this season, Robbins is 1-2 with a 4.66 goals against average and an .864 save percentage. While his consecutive point streak ended, Guus van Nes still had a 3 point weekend with 2 goals and an assist for the Junior Bruins in a pair of wins over the New Jersey Hitmen. He continues to lead the NCDC in scoring with 37 points (12 goals, 25 assists) in 27 games played. He is one point ahead of former Quinnipiac commit John DeRoche (36 points) who is now committed to the University of Vermont. Peter Diliberatore had an outstanding week for the Salisbury School. He had 5 points (1 goal, 4 assists) on the week and now leads both Salisbury and the Housatonic conference in scoring with 7 points (1 goal, 6 assists). The 2000 born Nova Scotian defenseman should get some serious NHL looks in the 2018 draft if his play continues at this pace. Matt Cassidy had a strong week for the Brooks Bandits with 4 points (2 goals, 2 assists) in three games played. The Medford, New Jersey native has points in 4 of his last 5 games for the Bandits. On the season in 25 games played he has 21 points (9 goals, 12 assists). Ethan de Jong made the Canada West team for the 2017 World Junior A Challenge. In the preliminary exhibition game against Russia he had the game winning goal in a 4-2 win along with an assist in the game. In the opening game of the tournament he had one goal in Canada West's 5-2 loss to the Czech Republic. While he is currently committed for 2019-2020, there is a good chance that is is going to be bumped up to next years class due to the offensive struggles Quinnipiac has suffered this year. Nick Kent is back healthy. After suffering a spleen injury, Kent has now joined the Wenatchee Wild. He has played 5 games but hasn't yet to record a point but this is a big step up for him in terms of competition being a 2001 born player in the BCHL. Ethan Phillips had a 3 point weekend (2 goals, 1 assist) as the Selects Academy at South Kent U-16 team split a pair of games against the Pittsburgh Penguins Elite. He now is 3rd on the team in scoring with 42 points (21 goals, 21 assists). Victor Czerneckianair had a another solid weekend for the South Kent U-15 team with 3 points (1 goal, 2 assists). On the season he has 41 points (19 goals, 22 assists) which puts him second on the team in goals and 3rd on the team in overall scoring. Jacob Quillan had a four point weekend (2 goals, 2 assists) for the Steele Subaru Major Midgets. On the season Quillan leads the team in scoring with 29 points (10 goals, 19 assists) in 25 games played. Austin Spiridakis picked up another assist this past weekend for the St. Albert Tire Warehouse Raiders AAA team. In 21 games played, Spiridakis has 10 points (5 goals, 5 assists). 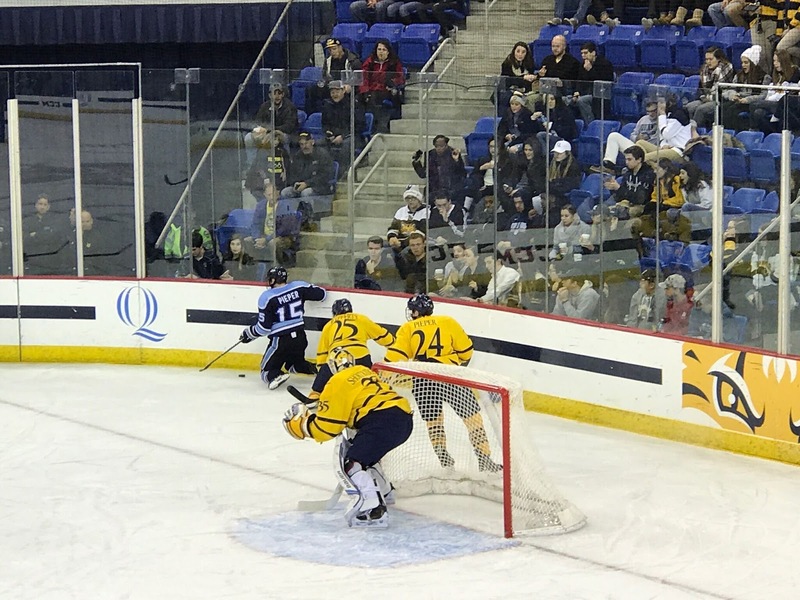 Two things were accomplished by the Quinnipiac Bobcats men's ice hockey tonight in a 7-4 defeat that had not happened in a long time and they were not something to be proud of. The loss by Quinnipiac ensures the team will head into a first semester break under .500 for the first time since the 2005-2006 season and second they gave up seven goals in a game since February 20, 2010 in a 7-3 loss to Union College. It was a stunning collapse for a team that raced to a 3-0 lead not even ten minutes into the game. Goals by Scott Davidson, Bo Pieper and Tanner MacMaster capped a four and half minute spurt by the Bobcats. It was Davidson's first goal since the East Regional final against UMass Lowell back on March 27, 2016 when Davidson was a freshman. Senior Bo Pieper scored his 3rd goal of the season three and a half minutes later when he buried a strong wrist shot past Jeremy Swayman. Less than a minute later Tanner MacMaster had a beauty of a toe drag goal past Swayman. Maine cut the Quinnipiac lead less than three minutes later to 3-1. Quinnipiac was really good for the first 13 minutes of the the first period and finished with a 23-4 shot differential. Two Quinnipiac penalties in the second period led to two Maine power play goals. First a Tanner MacMaster cross checking penalty led to a goal just 2:46 into the second period by Maine's Tim Doherty. Midway through the period a Matt Forchuk hooking penalty led to a Maine goal by Patrick Holway to tie the game at three after two periods. 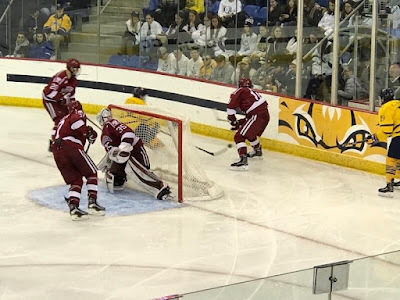 Quinnipiac took the lead back early in the third period when Karlis Cukste cleaned up a rebound in front off Thomas Aldworth's initial chance giving the Bobcats the lead once again. However Maine would tie the game back up on an unbelievable individual effort by freshman Eduards Tralmaks highlight reel goal as he used great stick work getting around Quinnipiac's Brandon Fortunato and then back handing one past Andrew Shortridge. The Black Bears took the lead five minutes later on Cedric Lacroix's first goal of the season and then the Bobcats saw the flood gates open up with two more Maine goals in less than two minutes. Keith Petruzzelli replaced Shortridge for the final three minutes of the game as Quinnipiac dropped to 6-9-2 with the loss and giving Maine its first ever win in Hamden against Quinnipiac. Despite getting out to an early lead, Quinnipiac could not keep the momentum along with not being able to play a full 60 minute game. There was defensive lapses, poor fore-checking and back-checking along with giving Maine easy access into the offensive zone on the night. After the first 13 minutes Maine took control of the game with strong play at the end of the first period and into the second period leading to this come from behind win so give the Black Bears all the credit for staying in this game not getting down on themselves when Quinnipiac got off to a fast start. Quinnipiac put an astounding 54 shots on Swayman who made 50 saves while Maine scored 7 goals off 30 shots. The two teams close out the first half of the season tomorrow night in Hamden where Quinnipiac looks to end the first half on a winning note. Quinnipiac is limping into the end the of the first semester having only gotten one point last weekend after losing to Harvard and having an embarrassing tie to Dartmouth on Saturday night. 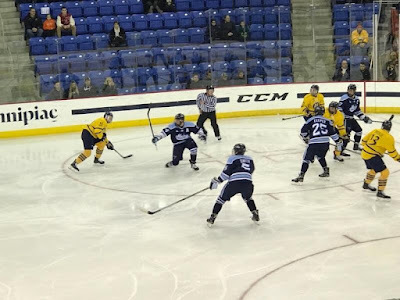 To close out the first half of the season the Bobcats welcome the Maine Black Bears to Hamden where it will be a Pieper brothers reunion with Bo's brother Canon a former Quinnipiac player now on the Maine side. Quinnipiac will be without Logan Mick on Friday night as he was suspended by ECAC Hockey for his hit on Dartmouth's Joey Matthews. All-time Quinnipiac is 4-4-1 against Maine with a 2-0 record against the Black Bears in Hamden. While Maine is averaging three goals per game this season (21st nationally), they have been Jekyll and Hyde a times. In 7 games which led to 6 wins they scored 4 or more goals. In those other 7 games they are averaging 1.14 goals per game and have been shutout 3 times this season. The question is which Maine offense will show up this weekend against Quinnipiac. The teams top five scorers are all underclassmen led by Mitchell Fossier (11 points), Eduards Tralmaks (9 points), Tim Doherty (9 points) and Chase Pearson (9 points). Two defenseman in Patrick Holway and Rob Michel have 8 points apiece. Former Quinnipiac forward Canon Pieper has 7 points and will play against his brother Bo in a reunion this weekend. The Maine power play is 34th in the country at 17.54% (10-of-57) and if there is one thing that Quinnipiac does fairly well its kill penalties at a clip of 84.1% (53-of-63) which ties them at 15th in the country. Maine's defense has been a mixed bag this season. While they give up 3.21 goals per game (tied for 42nd nationally) there have been a handful of games they have looked good keeping the goals allowed down while there have been others where they have given up five plus goals (BU, UConn and Miami games). They do a good job at blocking shots with 14 blocked shots per game. They struggle with puck possession and that has lead to lapses on the defense. Granted they are lucky to have Jeremy Swayman back there or things could be worse. Maine has a lot of youth on the defense with four of their six defenseman to play in 10 games or more either freshman or sophomores. When this team struggles it takes bad penalties. Maine is averaging 17.50 penalty minutes per game which is by far most in the country and it has killed them this year putting the defense in vulnerable positions. They have the worst penalty kill in the country at 69.1% so for Quinnipiac to be successful it would be smart to get Maine to take a slew of penalties this weekend to get on the power play where they could potentially do damage. Jeremy Swayman has been very good as a freshman in goal for the Black Bears. The Boston Bruins 4th round draft pick in 2017 has taken the starting job away from junior Rob McGovern and has a 5-3-1 record with a 2.38 goals against average and a .925 save percentage. At 6'2 he brings size in between the pipes but is active and will move out from the crease to cut off angles. 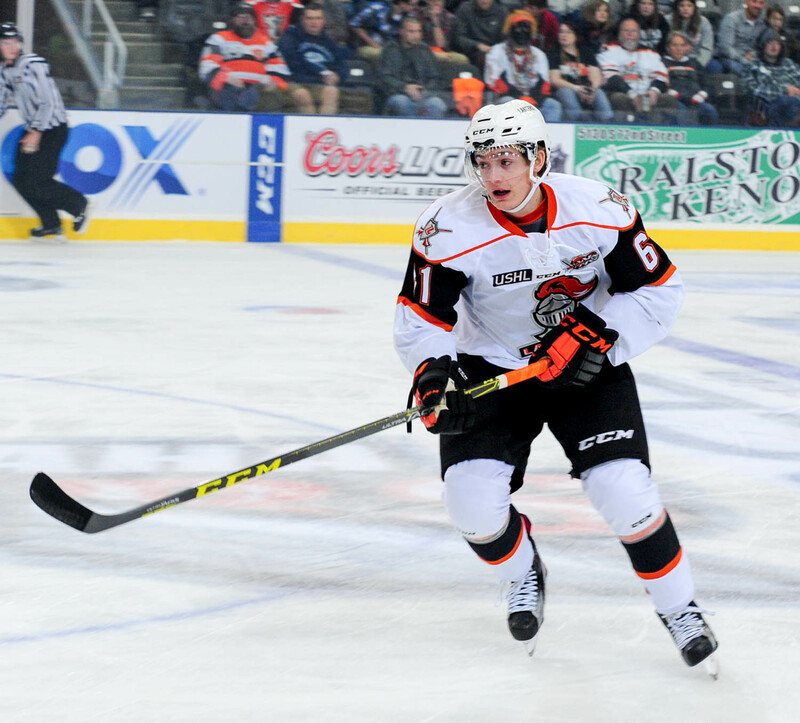 He recently was named to the preliminary roster for the United States World Junior team. He will present a challenge to Quinnipiac that has had massive issues scoring goals this season. 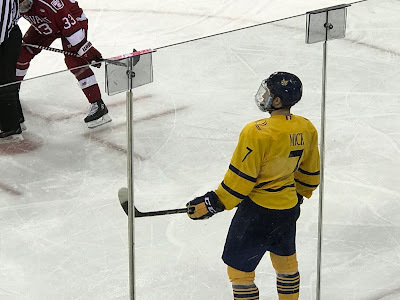 Quinnipiac needs go into the first semester break with some momentum against a team that is pretty mirage image to them in terms of being Jekyll and Hyde on the season. In order to avoid being under .500 at the end of a first semester since the 2005-2006 season, Quinnipiac will need to sweep Maine this weekend. Quinnipiac commit Ethan de Jong has been named to the Canada West team for the 2017 World Junior A Hockey Challenge that begins on December 10th in Nova Scotia. 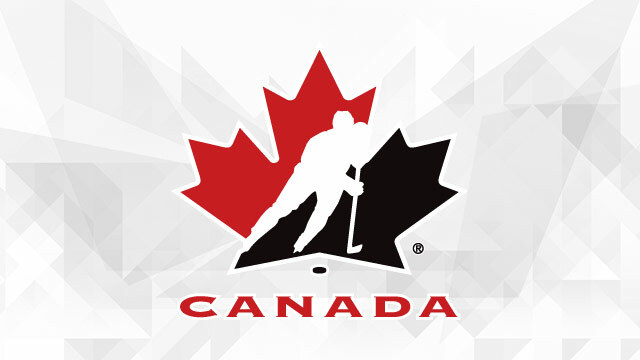 The tournament features teams from the United States, Russia, Czech Republic, Switzerland and two teams from Canada. The 5'10 175 pound de Jong has been one of the hottest players in the BCHL in the last month. He is currently riding a six game point streak (3 goals, 9 assists) and also has points in 10 of his last 11 games played (5 goals, 12 assists). He is currently tied for 6th in scoring in the BCHL with 38 points (12 goals, 26 assists) in 30 games played and is averaging 1.27 points per game this season. The BobcatsHockeyBlog and all of BobcatNation would like to congratulate Ethan on this great accomplishment in his hockey career. A night after both Quinnipiac and Dartmouth both got blitzed on the ice, the two teams skated to a scoreless tie on Saturday night at Frank Perotti, Jr. Arena in Hamden. 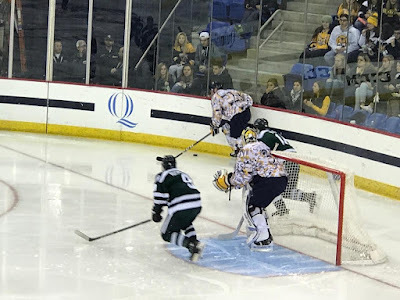 It was the first scoreless tie for Quinnipiac since November 25, 2016 when they tied St. Lawrence in the Friendship Four in Belfast, Northern Ireland before moving on to the finals of the tournament in a shootout. If you are fan of defense then this was the game for you tonight. Both goaltenders excelled with Andrew Shortridge making 27 saves for his fourth career shutout while Dartmouth's Aidan Clark who a night after being tagged for 5 goals on 12 shots made 43 saves for his first career shutout. Quinnipiac had a total of 84 shot attempts with 43 going on goal and also hit two posts on the night. Dartmouth blocked 24 Quinnipiac shots but it was once again the lack of the Bobcats ability to finish their chances that was on full display. Quinnipiac had a 4 on 1 chance on Dartmouth but hit the post. Odeen Tufto had a chance late in the third period as well but couldn't get it past Clark. The Bobcats couldn't find consistency in the third period especially after a brutal five minute major call on Logan Mick for interference which was only called after the Dartmouth player got injured. 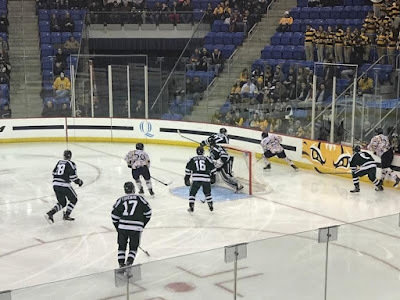 Dartmouth took three consecutive penalties within a three minute span giving Quinnipiac a big 5 on 3 chance for just over a minute. However Quinnipiac quickly erased that opportunity when Landon Smith took an interference call and then three minutes later took another one putting Quinnipiac on the penalty kill for the remainder of the third period and into the early part of overtime. 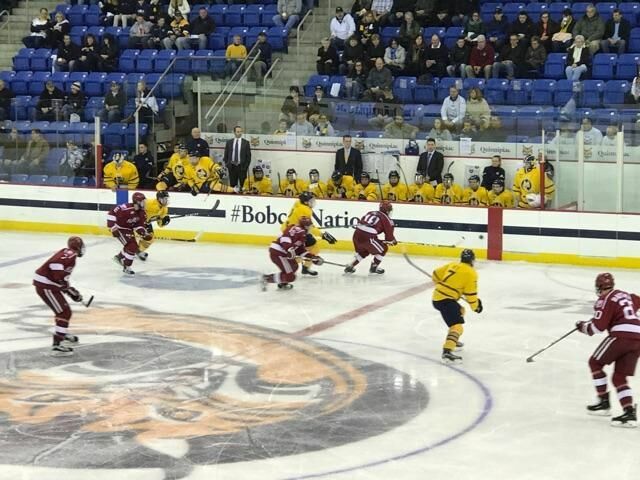 If there were any positives in a scoreless tie, its that Quinnipiac controlled the play for a majority of the game along with the fact they dominated on the face-off dot with Bo Pieper winning 22 of 31 and Scott Davidson winning 7 of 9. For the game Quinnipiac won 48 face-offs compared to 27 for Dartmouth. With the tie, Quinnipiac is now 6-8-2 (3-5-1 ECAC) on the season and tied for 8th in the conference standings. They wrap up play in the first semester next weekend when they host Maine in a pair of non conference games where they need to win both games to avoid ending a first half of the season with a losing record for the first time since the 2005-2006 season. Quinnipiac couldn't build off its strong performance Tuesday night against Princeton as they fell 6-2 on Friday to Harvard on white out night at Frank Perrotti , Jr. Arena. 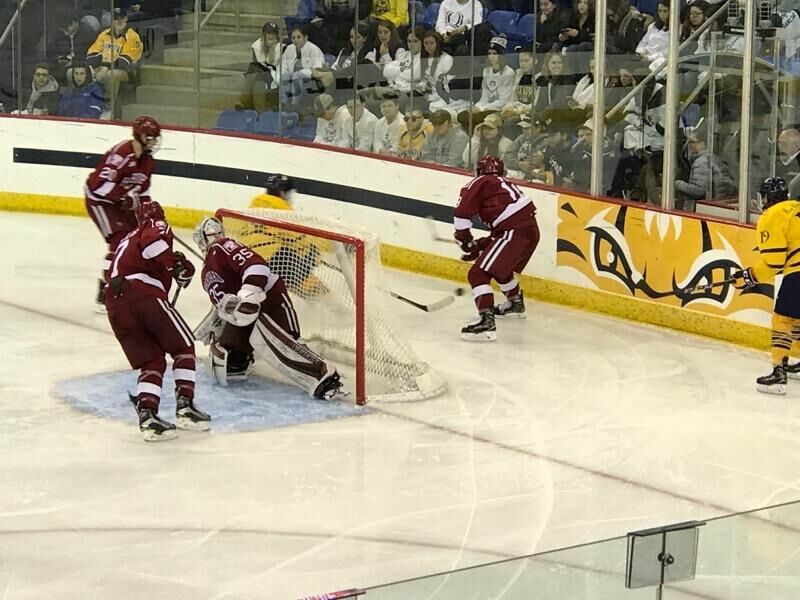 Quinnipiac was looking to build some momentum as the first semester winds down and while they got off to a quick start they couldn't sustain it as the game progressed as it was the Ryan Donato show that took over for the Crimson tonight. Just 3:51 into the game Matt Forchuk sent a great pass from the half wall where Nick Jermain tipped it past Michael Lackey for the goal. The Qunnipiac lead was short lived as just three minutes later Harvard's Wiley Sherman bombed a shot from the point past Andrew Shortridge to tie the game. Not even two and half minutes later Ryan Donato won a battle for the puck, made a quick move around John Furgele who got held up by the official and beat Shortridge right in front of the net. With less than three and half minutes to play in the first period, Harvard struck again with Lewis Zerter-Gossage sniping a shot throw traffic past Shortridge. The second period was fast with very few whistles along with no penalties yet to be called in the game. Harvard played a strong second frame despite not winning the shot total in the period. In the third both teams finally went to the penalty box for the games only two penalties early in the period. 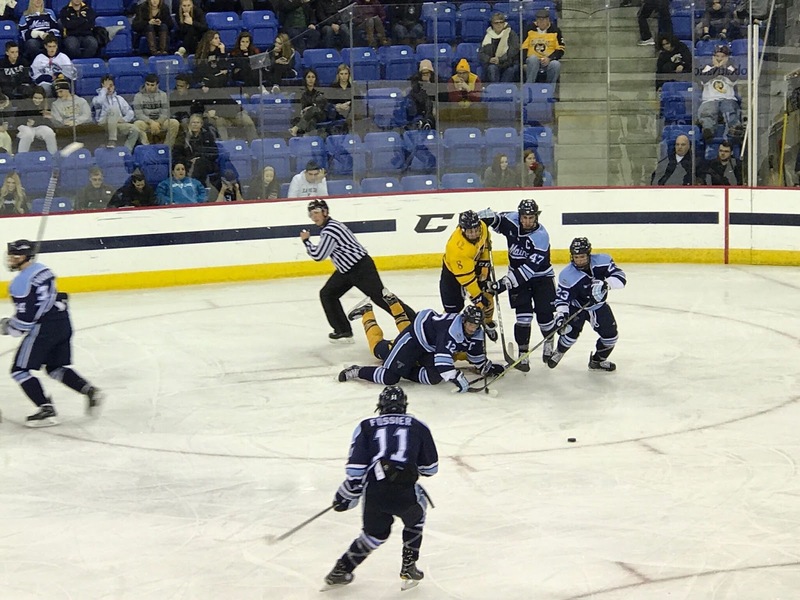 Quinnipiac would cut the lead to a goal when Odeen Tufto fed Tanner MacMaster racing into the offensive zone where he beat Lackey short side for the goal. The Bobcat momentum was gone in an instant when less than two minutes later it was Ryan Donato with a wrap around goal to give the Crimson a two goal edge again. Donato, a possible United States Olympian this winter took a major hit after scoring the goal. The Boston Bruins draft pick sealed the game with an empty net goal from deep in his own defensive zone. The Crimson added a garbage time five hole goal by Seb Lloyd. Quinnipiac once again made another goal-tender look great this time in Michael Lackey who had not seen game action since the 2015-2016 season. Despite Quinnipiac having 43 shots on the net, it is the lack of finishing ability this roster has that is preventing this offense from taking strides forward. Andrew Shortridge finished with 24 saves and wasn't at his best but he did not have a ton of help in front of him from his defense. The Bobcats will now try to salvage a split of the weekend when they welcome Dartmouth to Frank Perrotti, Jr. Arena tomorrow night. The Big Green are coming off a blow out loss 9-2 to Princeton in New Jersey.